Today was a critical day of competition at the 2013 DAKINE ISA World Junior Surfing Championship Presented by Billabong. After a day filled with Qualifying and Repechage heats, every heat is more important than ever. If one country loses one athlete, it can mean the end to their Gold Medal dreams. The famous Nicaraguan offshore wind continued to blow all day, although the surf was a bit smaller in the 3-4ft range. Big surprises came from Team Germany, Italy and Costa Rica as their athletes have advanced into the last stages of competition. The ISA’s mission of developing surfing globally is flourishing as athletes from non-traditional surfing nations are earning their spots in the final days of competition. “Intense action is taking place in these final days of competition,” remarked ISA President Fernando Aguerre. 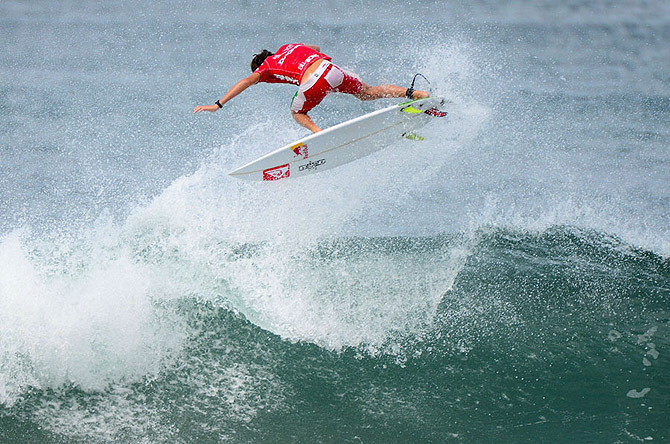 “The World Championship is reaching its most competitive stages, and the top surfers are shining big time. Saturday and Sunday are the final days, which include the Aloha Cup (team format competition) and the Grand Finals. I don’t want this championship to end, but it will end on Sunday, so log in and be part of this greatest junior surfing competition. The day began with Qualifying Heats in all four categories of the event, and finished with more elimination rounds in the Repechage. Germany’s Leon Glatzer and Italy’s Leonardo Fioravanti were the best surfers in the Boys Divisions. They competed in the Boys Under-16 and are now in the Qualifying Final, one step away from a Medal. In one of the day’s most exciting and highest scoring heats, Glatzer placed first earning 16.06 and Fioravanti in second, earning a 15.20 and sending to Repechage Imaikalani DeVault (HAW, 12.80) and Chris Zaffis (AUS, 12.70). Glatzer and Fioravanti had a slow start, but in the last two minutes of the heat they had an explosive exchange of high scoring waves that changed the situation, and both Europeans managed to advance to the next round. This could be the best individual result at an ISA World Championship in ISA history for both nations. Also in the Boys Under-16 Qualifying Final are Brazil’s Rafael Venuto and Australia’s Jacob Wilcox. The top two placing surfers will advance to the Grand Final and the other two will drop to Repechage for one last chance at a medal. In the Girls divisions, Tatiana Weston-Webb, from Hawaii, kept charging with full force towards the Grand Finals of the Under-18 category. With one of the highest scores of the day, 15.50, she defeated Larissa Santos (BRA, 8.73) and Josephine Costes (FRA, 7.87), who will now have to find their way to the Final through the Repechage. Weston-Webb dominated the heat right from the start after posting 8.00 points on her first wave. That score kept her in the lead and sealed her victory with a 7.50 towards the end of the Heat. Joining Weston-Web and Santos in the Girls Under-18 Qualifying Final are Barbados’ Chelsea Tuach and Australia’s Kristen Ogden. The top two placing surfers will advance to the Grand Final and the other two will drop to Repechage for one last chance at a medal. The Boys Under-18 Qualifying Final will feature Luke Hynd (AUS), Noe Mar McGonagle (CRI), Andy Criere (FRA), and Soli Bailey (AUS). The Girls Under-16 Qualifying Final will feature Frankie Harrer (USA), Karelle Poppke (TAH), Mahina Maeda (HAW), and the defending champion Dax McGill (HAW). In the Boys Repechage Rounds the best surfer was Japan’s Reo Inaba, who posted a heat total of 14.53 and in the Girls Repechage, Leilani McGonagle posted 16.17 points in the Under-16 keeping their hopes alive of reaching the Grand Final. In the overall team standings, Hawaii and Australia have pulled away leading in first and second place respectively. Fighting for the next top spots are USA (3rd), France (4th), Japan (5th), South Africa (6th), Brazil (7th), and Peru (8th). The 2013 DAKINE ISA World Junior Surfing Championship resumes Saturday at 7:40am with The Morning Show hosted by Chris Ernst, and with guests from Team USA Nikki Veisins and Cam Richards, Barbado’s Chelsea Tuach, and Russia’s Nikita Avdeev.